According to Ecommerce Europe the UK, France and Germany together are responsible for 70% of the total EU market and for about 62% of Europe. France especially offers interesting opportunities for Dutch entrepreneurs. With sales of approximately € 45 billion in 2012 the sector initiated positive developments in recent years despite of the economic crisis. 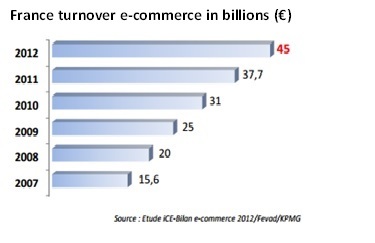 B2C E-Commerce sales in France are projected to increase to reach almost € 70 billion in 2015, according to mr Marc Lolivier, Managing director of Fevad (La Fédération du e-commerce et de la vente à distance). The potential of the market is also reflected in the growing number of online customers. In the first quarter of 2012 the amount of customers was set at 31 million, while the estimation for the same period in 2013 was 32.6 million. With a rate of only 57 % of individuals who shop online compared to f.e. 65 % in the Netherlands, there are still plenty of growth opportunities. Especially when you take into account the fact that the French market is about four times as big as the Dutch market. 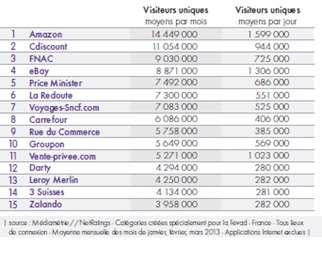 Much of today's online consumers visit at least one of the top 15 e-commerce websites, with Amazon, FNAC and Cdiscount generating the most unique visitors on a monthly basis. Although the French market has great potential and offers many possibilities for foreign entrepreneurs, a number of specific characteristics are very essential to take into account and to guarantee success. When starting up a web shop in France, it is important to give it a fully French appearance. A Frenchman for example loves confidence and therefore giving him the idea to do business with a French company will convince him when doing purchases on the internet. This means a translation of your web shop alone will not be sufficient. Registration with a French address and having a French speaking customer service are then indispensable. You should also think carefully about the organization of your deliveries and returns, because research has shown that 30% of the French consumers indicate to only shop online if the procedure of returning articles is organized well. So make sure to have a French return address and a reliable carrier. Another aspect to take into account is the fact that in France the ‘card bleu’ is by far the most widely used online payment method, followed by PayPal. The French consumer is very sensitive to safe banking and therefore it’s advisable to use the 3D Secure protocol security. In other words, with the right tools and a good preparation, there are plenty of business opportunities to start up a business in France. We are looking forward to support you in setting up or optimizing your French web shop! For more information, please contact us (without further commitments).